Today front page lead of the Star. The Government is into the 14 days in the search and rescue operation and the acting Minister of Transport, YB Dato’ Hishamuddin Hussein, has been advising members of the public not to speculate on the missing MH 370. On the other hand, the newly crowned Star Group Chief Editor is taking The Star further down the road of ridicule. A silly story of a woman claiming to have seen the wreckage of an aircraft from 35,000 feet above makes it to the front page of the Star today, HERE. 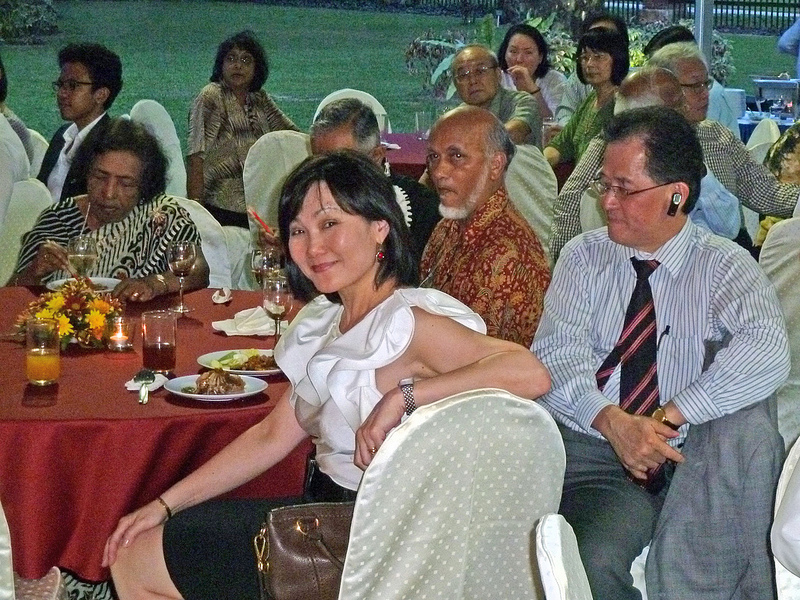 Ms June Wong, the Group Chief Editor of The Star Newspapers. She is in white blouse. During these 14 agonising days for everyone especially the loved ones of the 239 passengers and the crews, it was not too smart of the newly crowned Group Chief Editor Editor of the Star, Ms June Wong, to use such speculative story as its front page lead for today. Poor judgement is too mild to describe her decision. Such speculative story during such difficult times does not deserve a page one lead. Malaysia is already under the microscope of the international press. Such front-page story by the Star, will make the world laugh at Malaysia. It seems that it was not enough that Malaysia already been made a laughing stock by the international press on the story of the “bomoh” with their two coconuts, bamboo binoculars and flying carpet. Now a mainstream newspapers Star, which claims that it is the highest selling papers in Malaysia is no better than the “bomoh” after all. At this stage, the search and rescue operation involved 26 countries with more than 50 aircraft and 30 ships using state-of-the-art tracking equipment and they are no where near in locating MH370. Let our government and the other 26 countries concentrate in the search and rescue operation of MH 370. We do not need the front page headline of the Star to distract their efforts to search and rescue MH370. Malaysia does not need such a not-so-smart story as its front page lead to further confuse the public. Yours truly has refrained from posting new stories in order to avoid confusion and to add more pains and sufferings to the loved ones of the passengers and crews. Yours truly hopes that the woman shown in the front page of Star was not using the “bamboo binocular” to identify the objects 35,000 feet below as parts of an aircraft. 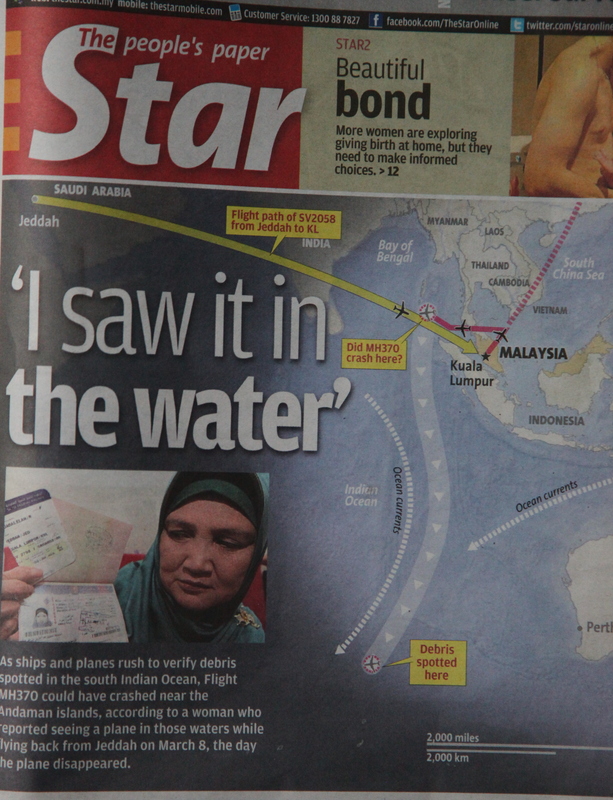 Or did Ms June Wong use a “bamboo binocular” to dig out this story and place it on Star’s front page? Was this another “Api Dalam Sekam” effort to sabotage the MCA and make BN look silly? In the interim, let us pray for the safety of the 239 passengers, crews and their loved one. Whilst we must be prepared for the worst, we must not give up hope. This is June Wong standard for a front page headline during this challenging time. Does she deserve to be Chief Editor of a newspaper? At this stage of the SAR, no chief editor in the world would have allowed such silly account to be published in the front page. Common sense will tell anybody of modicum intelligence that there is no way one can determine the object below 3,500 feet. This is what you get when you select a person like June Wong to head a newspapers. YB please don’t blame June Wong because she has done her best. Don’t expect more than such headlines – “i saw it in the water”. The useless MCA leaders should be blame for selecting people like June Wong to head the Star. They should know better the background of June Wong. Her political affiliation is clear. Only the useless MCA leaders did not know about her. Why blame her? I agree. The clueless MCA leaders knew who is this June Wong and they picked her to be chief editor then they deserved what they get from her. The MCA leaders are not complaining. Why are you complaining YB? I can only say padan muka to the MCA. Our government and the other 26 countries are concentrating to search and rescue MH370. This clueless chief editor June Wong is busy diverting attention by publishing stupid headline of no significance. By the look of things, she is trying to enjoy her last few days or weeks of being called the shortest chief editor of all times. May be that half past six chief editor was having problem in coming with a headline story. She is just clueless like the MCA leaders. So they are a good pairs. Perhaps the MCA leaders should approve a new Bentley car for her and her to flash around. Whilst it’s true that it would be almost impossible to see a plane in the sea below from 35,000 feet, I wouldn’t disregard this lady’s story outright but would take it into consideration in SAR efforts, especially since the location is within the wide area where the plane could possibly be. After all, she’s serious enough about it to lodge police reports, so I wouldn’t dismiss her off her claim too soon. However, if a plane did land in the sea and float for a while as this plane she allegedly saw obviously did, I’m sure the passengers and crew would have evacuated into life rafts, unless they were all unconscious or already dead. Anyway, this part of the Indian Ocean is less deep than the area 2,000km west, south-west of Australia where satellite detected what could be debris from the aircraft. That part off Australia is near its deepest point which is over 8,000 metres deep or as deep as Mount Everest is tall. What is important: June Wong thought that one could see from 35,000 feet. So she put it into the front page to impress Malaysians and the world whilst 26 countries and Malaysian authorities were busy looking for MH370 in the southern corridors. She is clueless. I support the suggestion that she is not a fault here but the equally clueless MCA leaders. June Wong what had happened to the macik report that she saw MH370 from 35,000 feet. Having put it on the front page, you should now follow up. Why suddenly went on a silence mode. incompetent is the word for her. Botak, you have been so kind to your boss Tony. Tony has said that AirAsia will not send its aircraft for maintenance/service in MAS. Now the pariah had to eat his words and sent its aircraft to MAS. We want to know what is the rate you are charging the pariah and whether the account has been settled or you are doing the service on credit like your own grandfather company.